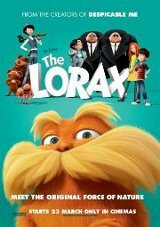 The latest Dr. Seuss book to get the Hollywood treatment revolves around The Lorax, who would like to fix the pollution in his town, caused by a greedy industrialist. Help arrives in the form of a young man desperate to impress his girlfriend by producing a real tree, not the plastic ones they have in town. This sets up the battle between the young man, The Lorax, and the evil mayor.